It’s midnight and I’m convinced I’ll be dead of a brain tumor by first light. How I even know about brain tumors is a mystery. I’m six years old and no one in my small world has ever had one. Still, I’m panicking, gulping at the air, trembling beneath the covers. My mother tries to hold me and talk me down, but I’m too far gone to be comforted. Finally, near tears herself, she phones an old family friend who happens to be a world-famous neurosurgeon. Fifteen minutes later he shows up at our house and puts me through the paces of basic neurology tests—close your eyes and touch the tip of your forefinger to the tip of your nose, walk heel to toe in a straight line across the room—then he promises me I don’t have a brain tumor. I believe him—for now. The Brain Tumor Episode was not the first—or last—time I believed I was at risk of imminent death. Worries over nuclear war, fire, kidnapping, and tse-tse flies had all come before. In college, I found my way more than once to the emergency room, certain I was dying of an MI. (I was up on the lingo for myocardial infarction, aka heart attack, and many other conditions after spending countless hours watching doctor shows.) Inevitably, the ER doc would tell me I was having a panic attack and shoot me up with valium. I can’t remember a time when I wasn’t prone to anxiety. I can’t remember a time when I haven’t wrestled with fear. In a sense, fear and anxiety have been my greatest teachers, moment by moment prompting me to come to grips with living in a body, living in the world. In a sense, fear and anxiety have been my greatest teachers, moment by moment prompting me to come to grips with living in a body, living in the world. The Latin root of anxiety is angere, to choke or strangle—just the sort of sensation felt during a panic attack. According to the National Institute of Mental Health, anxiety disorders affect about 40 million American adults aged 18 years and older—about 18% of the population. Women are 60% more likely than men to experience an anxiety disorder over their lifetime, and a large national survey of adolescents reported that about 8% of teens ages 13-18 have an anxiety disorder, with symptoms commonly emerging around age six (hello!). And these are only the folks who get a formal diagnosis of anxiety in one of its recognized forms: generalized anxiety disorder, obsessive-complusive disorder, social phobia and other phobias (snakes, airplanes, heights, you name it), panic disorder, and post-traumatic stress. 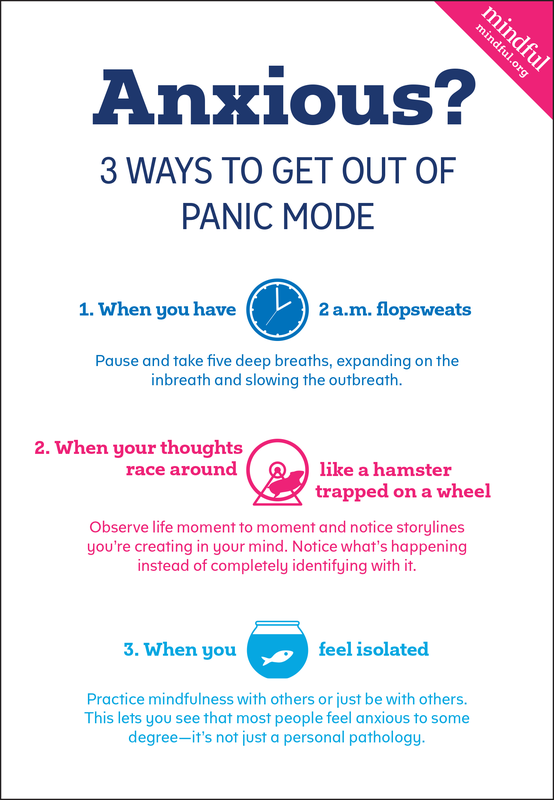 When you break out in a nervous sweat: Pause and take five deep breaths, expanding on the in-breath and slowing the out-breath. When your mind won’t stop racing: Observe life moment to moment and notice storylines you’re creating in your mind. Notice what’s happening instead of completely identifying with it. When you feel far from others: Practice mindfulness with others or just be with others. This lets you set hat most people feel anxious to some degree—it’s not just a personal pathology. 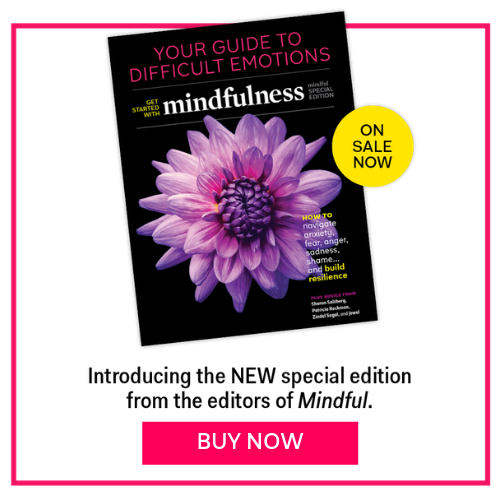 Read the full story in the December 2014 issue of Mindful magazine.